The Nutrient and Pest Management and the Wisconsin Cropping Weed Science programs have recently updated the Wisconsin herbicide mode of action chart. This publication provides herbicide mode of action, group number, site of action, chemical family, active ingredient, and example trade names for herbicides currently registered in Wisconsin. 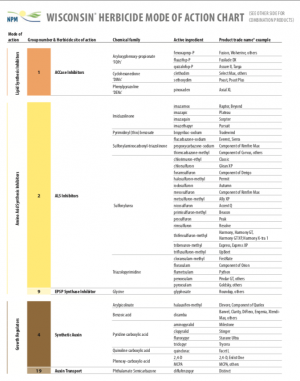 The second page of the chart details registered herbicide combination products in Wisconsin including the trade name, active ingredients, trade name examples included in the premix, and site of action group. With the widespread occurrence of herbicide-resistant weeds, it’s important that farmers and crop advisors select effective herbicides from multiple sites of action. The intent of this publication is to help farmers and crop advisors understand the different sites of action and products registered in Wisconsin and assist with their herbicide selection. Next post: The 2019 Wisconsin Soybean Yield Contest is Announced!